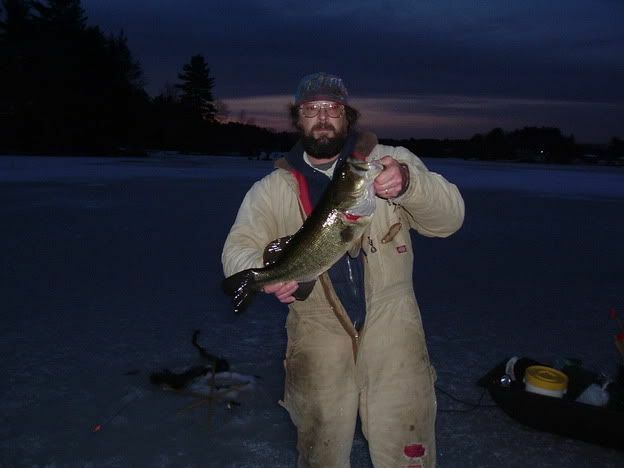 Northeast Bass Fishing Forums - Quaddick...Sat.28th..BIG FISH PICS!!! Me and a few friends made it out to Quaddick saturday for some icefishing,and the results were rather good. In the next cpl. hours we all were pretty active,with me getting a cpl. more 2+ lbs.LMB's. Well just before noon,Mike had a flag go up and the game was on.He was using 12lb.test leaders and medium shiners when the big one came to play.The battle lasted awhile,then it was over and the Beast was iced....41" and 16lbs. of angry Pike was staring back at us..
Well after that,we were all pretty excited and for good reason.We stayed a cpl. more hours and landed crappie and LMB's,but the day was complete already. The group next to us was fishing for Pike,and caught this beautiful LMB...6.9lbs. All fish were caught in 8-10 ft. of water with medium&medium heavy shiners. Well this was my first report with pics,and im glad it is done.Hope you enjoy the post as much as i enjoyed making it. Nice pictures and Fish! Makes me want to try some ice fishing. Never done it due to the cold but with results like that. Who can't want to try it? Nice job again guys! Post some more picture the next time you go. 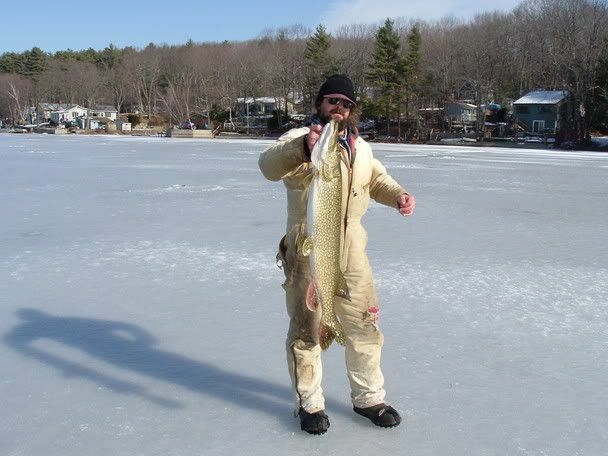 Thats an awesome day of ice fishing! I'm shocked that there is safe ice any where in southern New England. I wonder what this rain will do to the ice? Hey Babs, thanks for the report and awesome pics!! Otherwise, keep up the great work with the reports! CURT....that LMB was returned to the water after being weighed in for a derby that guy was invovled in.I should have stated that to clear up any contraversy. 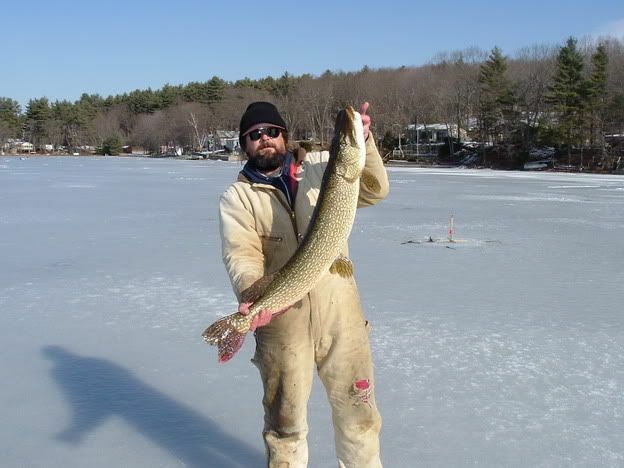 My wife said she will no longer swim in Quaddick lake after I showed her the picture of that big pike.